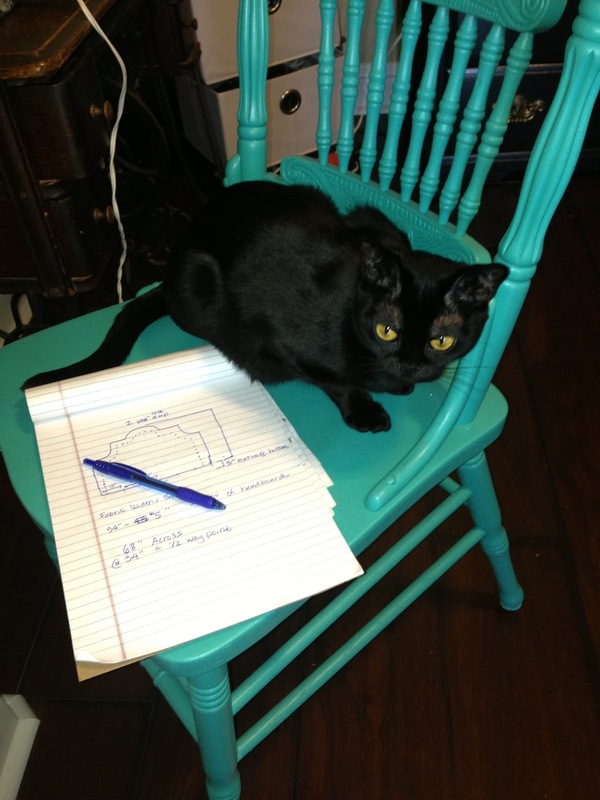 First, have your cat draw up the plans for the headboard...Tino, my little helper really just observed! 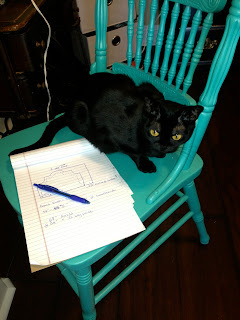 You will want to draw out your design, calculate how wide and tall of a headboard you need and then do the math to make the numbers equal out. 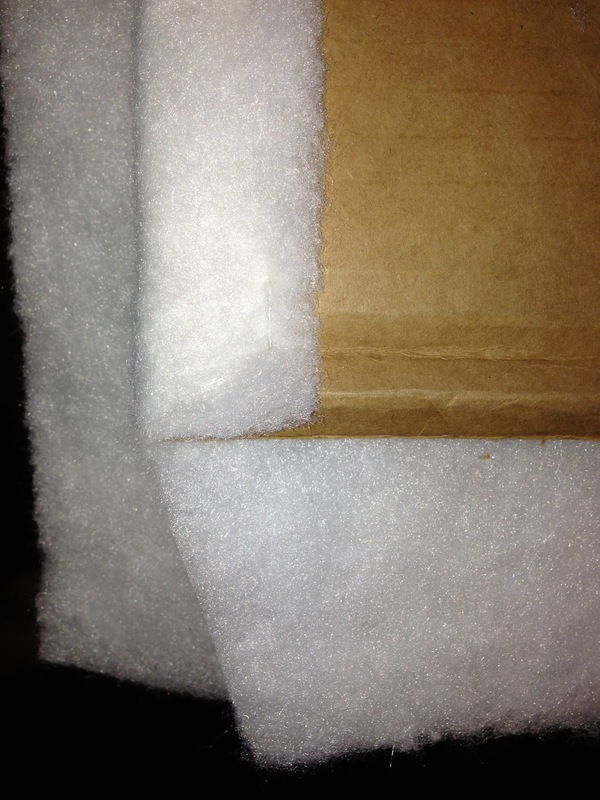 For mine, all sections were about the same, but I added 1'' to each of the 2 outside sections. 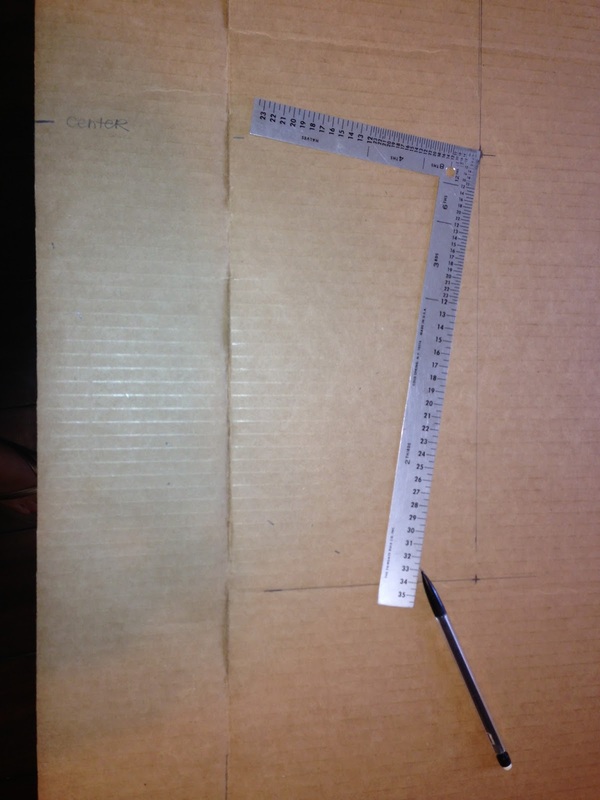 Layout a giant piece of cardboard, mine is 70'' wide. To make a half circle shape at the top I figured out how tall I wanted the design. 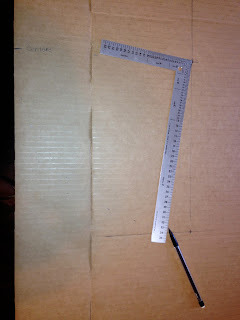 Then using this ruler I marked 11'' from the center point (think of using a compass back in the day at school). I will say, this came pretty easy to me from taking paternmaking in college. Don't over think it. It's essentially like making a giant rainbow where all points of the rainbow hit 11'' out from the center. Note how I've marked the circles & used the 90 degree angles to help me get started. Left View. Same as above, right view. 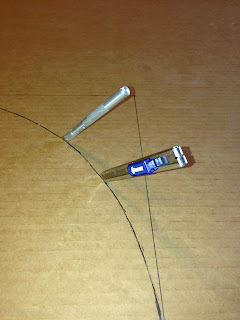 Detail of how I marked the design and measured out an exact distance from the center point. Center point is the 90 degree angle intersection of the two straight lines. Detail of half circle design at the top. 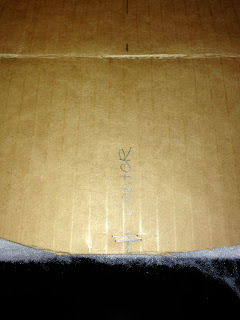 Again, mark center point, measure out distance from center point. Begin cutting out your design with a sharp Exact-o knife. I tried two to see which worked better. Make sure you SCORE the cardboard first. If you aren't familiar with this technique, it will be very beneficial to you to learn it. 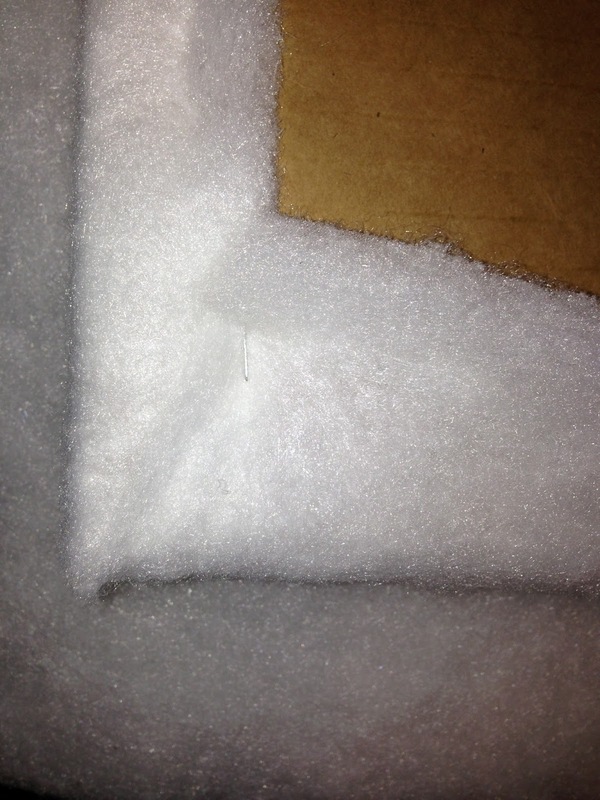 I put my self healing cutting matt under the cardboard. Yeah!!! We've got the design!! Pretty cool when you get to this point. Next, you'll cover this bad boy in batting. 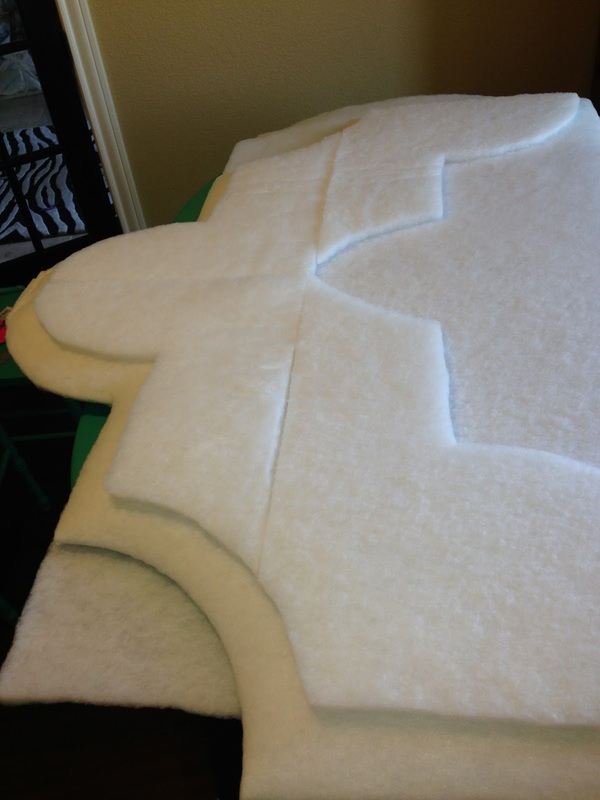 Lay out all thicknesses of pre-cut batting on top of each other. I had the lady at JoAnn cut mine to the width I needed (height was already determined by the roll). 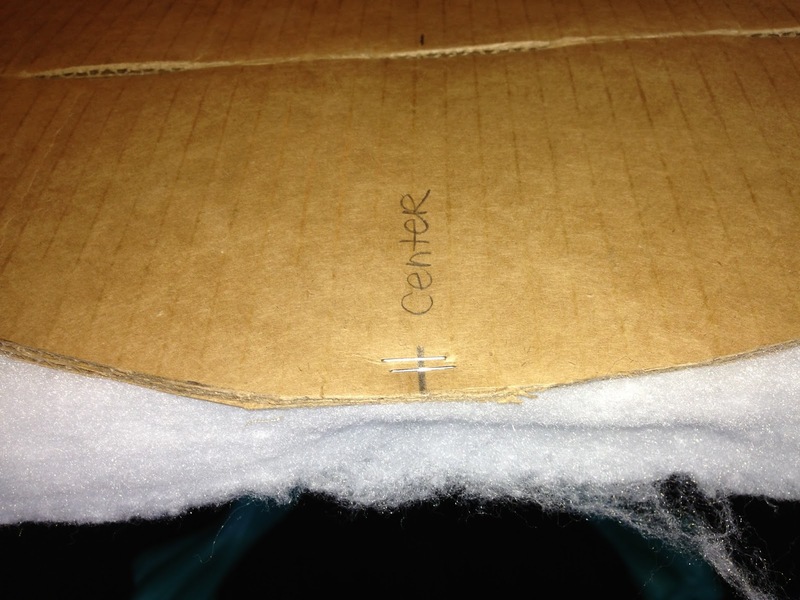 Start at the bottom to make sure the batting is straight, and begin stapling the batting to the cardboard. You will want to have the batting taught on all edges. Not tight as to compress it, and not loose. 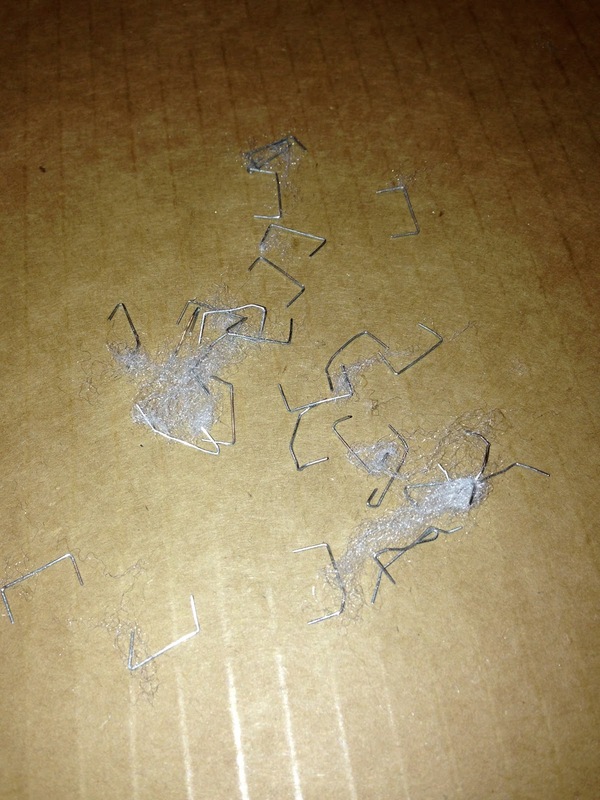 You will have a little extra above the staples, no biggie. Mark the center at the top and bottom. This will be very helpful when you get to the fabric covering part. For now, my batting just came to the edge at the top due to the width. I just stapled down into the batting to secure the top at this small portion. As your stapling your first layer around, cut free the excess at the corners to eliminate the bulk. 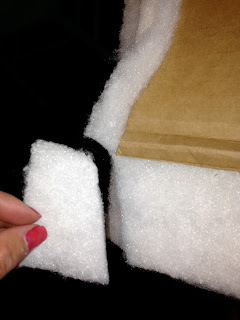 Fold in and secure with staples. First layer of right side cut out and ready to secure. 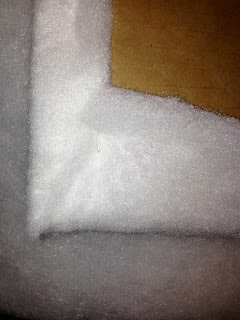 Corner and side sections stapled down. Pull batting tight as you staple around the corner, it should be very smooth. 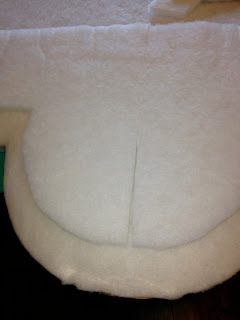 Detail of top section, first layer, stapled down. 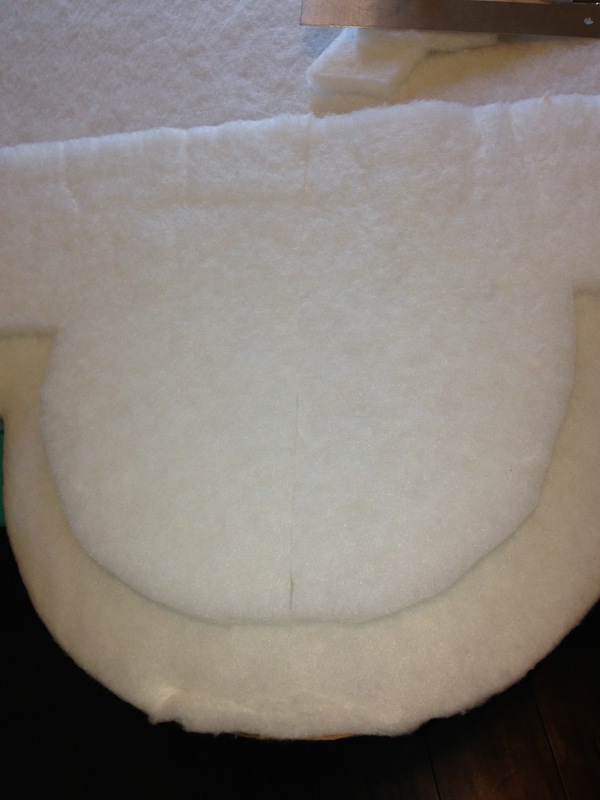 Cut excess and fold in nicely (this is now layer 2). Ah, now we have used all 3 layers of pre cut batting but we have so much extra! NO problem! 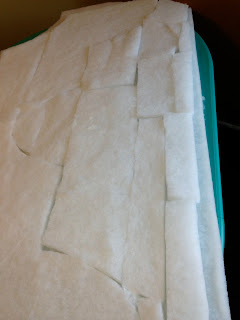 I could foresee this and planned to use the cuttings as the inside 4th layer. Interior 4th layer. I've planned to use nailhead trip at about 3 1/2'' in from the edge. By creating an interior 4th layer when I put the nailheads in the inside will be thicker than the outside border, which is what I want. 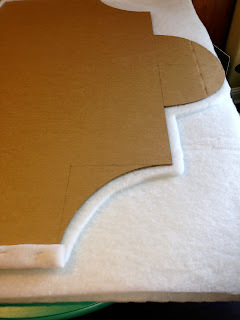 This step is not necessary, but in my opinion just makes the headboard thicker and look better. Why no, you have all the cuttings! Piece the cuttings until you fill up the 4th interior layer. Continue piecing, I hope you like geometry! Oh, it fits soooo nicely! Used a few tiny cuttings in the center, but for the most part was able to use large chunks. My fully finished, interior 4th layer, batting puzzle! 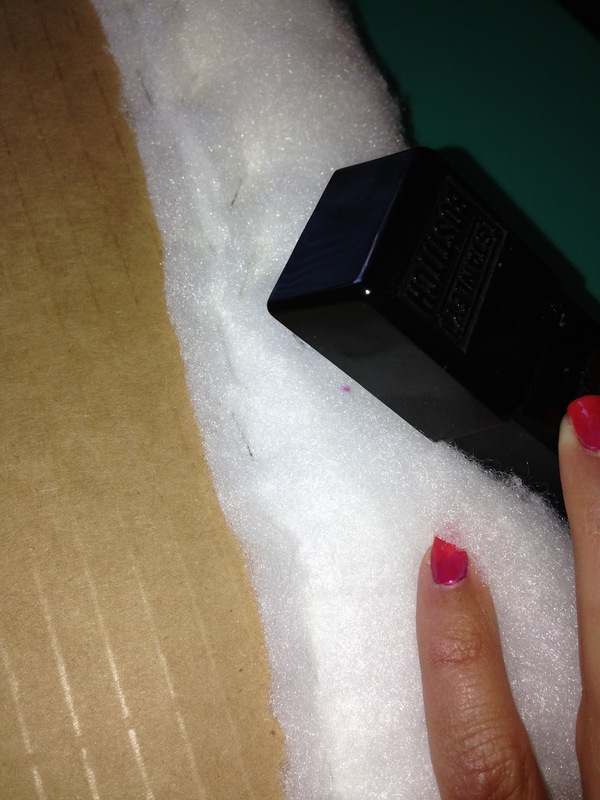 Staple at an angle to make it easier to release the stapler and to move on quicker. I found this very helpful. 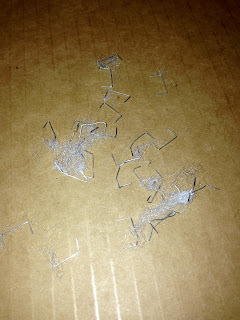 Plan on having a nice little pile of staples that won't go through the cardboard.... it happens. Oh well! 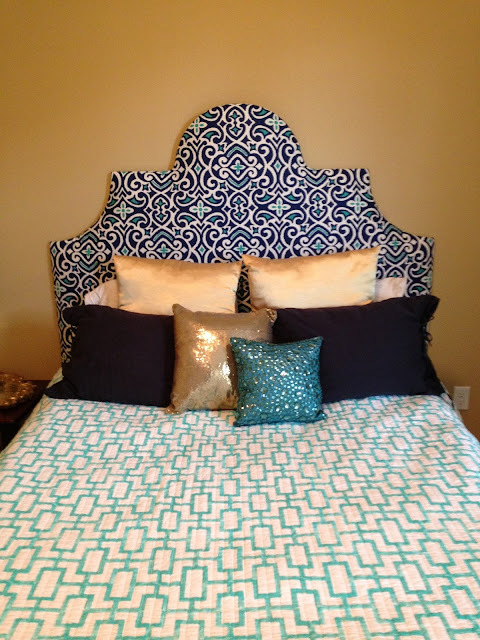 After you've secured all the layers one at a time you should have a pretty awesome looking head board. I'll be posting part 2 soon. Stay tuned and good luck!! Follow up on Part 2 HERE! Where did you get the large piece of cardboard? Just made this for vacation!